Lessons learned and implications for future innovation and practice. Disclaimer: The perspectives provided in this manuscript are those of the authors and do not reflect the official position of the United States Air Force or the Department of Defense. Medicine has experienced a revolution in the use of catheter-based, endovascular techniques to manage vascular disease over the past 2 decades. In many scenarios, a less invasive endovascular approach to arterial disease or venous pathology is associated with less morbidity and lower mortality than a traditional open surgical approach. 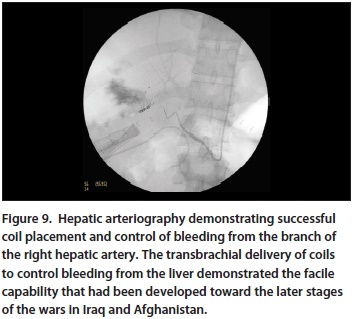 A number of lessons from recent experiences in Afghanistan and Iraq—the first wars in which endovascular-trained providers have been deployed—shed new light on the utility of catheter-based approaches to injury.16,17 In contrast to the medical advances for which the military has been the vanguard, the military has mostly benefitted in terms of endovascular therapies, receiving and implementing techniques that had been pioneered and applied in the civilian sector (Figure 2). 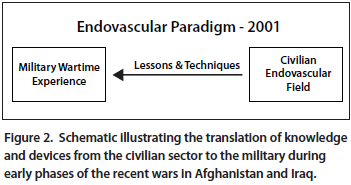 During the terminal phases of the wars in Afghanistan and Iraq, the military’s Joint Trauma System and its Combat Casualty Care Research Program had attempted to characterize lessons learned from the use of endovascular therapies in wartime.17 These efforts are a data-driven response built on an understanding of the timing and cause of mortality on the battlefield and the potential for endovascular intervention to mitigate shock and hemorrhage.18,19 The military also recognizes that if endovascular technologies evolve toward the treatment of injury and shock as rapidly as they have been applied to vascular disease states, these technologies will undoubtedly play a greater role in the future management of trauma. Guided by data showing that most combat-related deaths result from hemorrhage prior to the patient arriving to an operating room or endovascular suite, the military has proposed broader attainment of fundamental skills of vascular access and catheter-based intervention among prehospital and emergency care providers (medics, emergency physicians, and general surgeons). Additionally, the military has started to make existing and future endovascular approaches more amenable to the acute setting of trauma and shock. 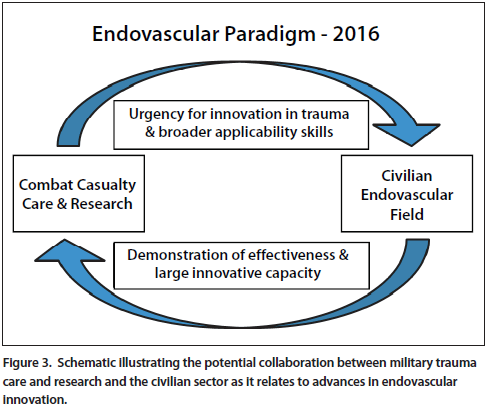 If aligned correctly, the military and civilian sectors can reach a more modern and productive association in which they are motivated by and benefit from each other’s needs and capabilities in the endovascular arena (ie, address and innovate for both trauma and disease) (Figure 3). The objective of this report is to characterize the relationship between civilian endovascular capability and the military’s trauma care mission—past, present, and future. We aim to highlight the lessons learned from the civilian experience with endovascular technologies that have translated to military trauma care. The report also describes the lessons learned from the military’s contemporary wartime experience and their influence on the future of catheter-based therapies for injury and shock. The foundation provided by the civilian vascular, trauma, and interventional communities at the start of the wars in Afghanistan and Iraq was a demonstration of improved outcomes using endovascular techniques for certain injury patterns. At that time, the military had no deployable endovascular capability and was using a doctrine stating that vascular injury was best diagnosed and managed using open surgical techniques. In a revealing 2004 publication, Gawande noted, “there is no facility or expertise in Iraq even for the routine placement of inferior vena cava filters.”20 The military’s approach was understandable and largely one of practicality, given the novelty of endovascular therapies and the harsh limitations of austere wartime surgery. However, as the theaters of war became more advanced and civilian evidence continued to demonstrate the effectiveness of endovascular capabilities, the military was forced to reappraise its approach. Soon after Gawande’s article and largely as a consequence of deployment of trained endovascular surgeons, the military developed and reported on progressively more complex endovascular capability in the wartime setting.17,21,22 Initially, this occurred at the level III surgical facility at Balad Air Base, Iraq (Figure 4), but a similar trauma-specific endovascular capability was soon developed at the Air Force Theater Hospital at Bagram Air Field, Afghanistan. 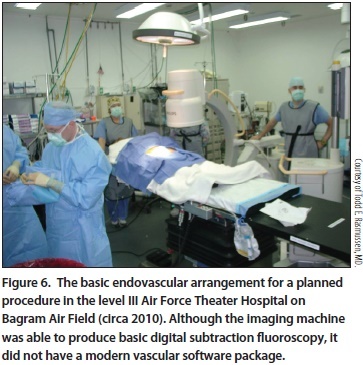 Other facilities, such as the US Navy level III facility in Kandahar, Afghanistan, followed in establishing endovascular capability, largely through efforts of forward-leaning and expert interventional radiologists. The military’s integration of endovascular capability into its combat casualty care doctrine and clinical practice guidelines is far from uniform or complete. However, after demonstrating feasibility and effectiveness in austere environments, the military will need to leverage ongoing civilian experience and account for endovascular approaches (inventory, imaging, and indications) as it plans for future combat casualty care scenarios, especially scenarios in which an endovascular approach has become the accepted standard. The civilian sector has also shown the relevance of catheter-based endovascular training. Whether in the form of fellowship-trained surgeons, radiologists, cardiologists, or other categories of providers, the civilian clinical and academic communities—many of which have trained military providers—have demonstrated the importance of programs that account for catheter-based expertise. Outside the combat zone, the vast majority of the military’s endovascular specialists are engaged in managing age-related disease in the beneficiary population of the Military Health System. However, this same cadre of endovascular experts deploys to austere locations where they manage severe combat-related injury to the best of their ability. As endovascular therapies continue to improve and their effectiveness in managing certain injury scenarios becomes more established, the military and its endovascular specialists will need to prepare for catheter-based capabilities as they balance beneficiary care with readiness for state-of-the-art combat casualty care. The civilian sector has also provided the military with a host of vascular access and catheter-based technologies that could be utilized for certain scenarios of injury. Modern access devices such as small-caliber access needles, wires, and sheaths that facilitate safe and rapid ultrasound-guided entry into the vascular system were not included in traditional combat casualty care sets and kits. Similarly, the civilian community pioneered the use of covered stent technology (ie, stent grafts) and catheter-delivered hemostatic products (eg, coils, foams, and plugs) for managing vascular injury and bleeding from solid organ injury. Finally, compliant balloons for large vessel occlusion were pioneered by the civilian sector to be used with larger stent grafts and in managing aortic pathology. This proven technology was available to the military’s deploying surgeons and was implemented in Iraq and Afghanistan. Although none of these devices has a trauma indication, and the best paradigm for a trauma-specific endovascular inventory is not defined, without civilian innovation and commercialization in the endovascular arena, the military’s tool box for hemorrhage control, resuscitation, and vascular repair would have remained the same as it was at the end of the Vietnam War. Compelled to assemble supplies to be utilized in theaters of war, the military demonstrated the value of a trauma-specific endovascular inventory.17 In this effort, the military showed that it was practical to have a limited inventory within trauma-relevant categories: vascular access, basic sheaths and catheters, 0.035-inch guidewires, covered stents, 0.035-inch coils, one type of compliant large-vessel occlusion balloon, and one type of removable vena cava filter (Figure 5 and Figure 6). A comprehensive description of the inventory is beyond the scope of this report, but out of necessity, the military’s inventory maintained a narrow focus. For example, the catheter-based inventory did not include angioplasty balloons, thrombolytic platforms, 0.014- or 0.018-inch guidewires, 0.014- or 0.018-inch–based devices, or bare-metal stents. Although any given case may have benefited from the availability of a more comprehensive inventory (ie, “just one more” wire, catheter, or stent), the setting in which the supplies were assembled, stored, and used necessitated efficiency. The trauma-specific endovascular inventory for military purposes is in contrast to civilian stock rooms intended to manage many different conditions and circumstances. It should be emphasized that the military’s trauma-specific endovascular inventory is not fully defined or established in doctrine at this time. 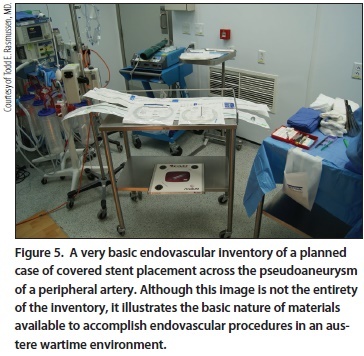 However, recent experience should provide a foundation for military medical planners to ensure relevant endovascular inventories are included in future forward surgical units and theater hospitals. 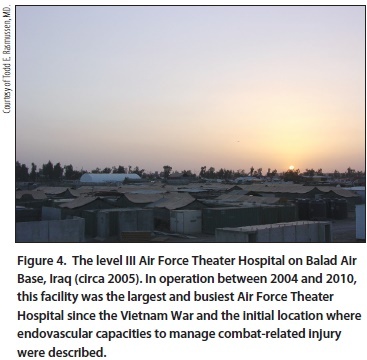 Finally, aspects of the military’s experience in establishing a trauma-specific endovascular inventory may provide a model for civilian centers to improve efficiency in providing catheter-based capability in the trauma setting. 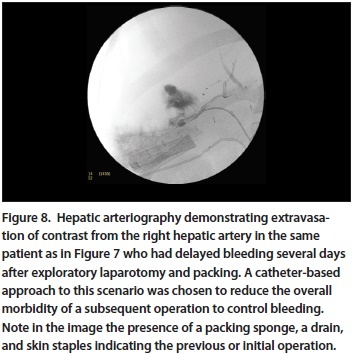 The military has the ability to accomplish endovascular procedures in challenging circumstances using a limited inventory with limited imaging capability (Figure 7, Figure 8 and Figure 9).17,21 Military providers showed that catheter-based procedures can be accomplished in the acute setting using analog and digital x-ray machines, small and dated fluoroscopic units designed for orthopedic procedures, and without vascular software packages (Figure 6). Although the number and complexity of endovascular procedures performed in Iraq and Afghanistan were relatively limited, placement of covered stents, snare retrieval of missile emboli, and coil embolization of solid organ injury, pelvic fracture, and pseudoaneurysms were accomplished using rudimentary imaging devices and inventories.17,21 This experience provides a balanced perspective in an era that demands the best imaging unit or next-generation endovascular device and provides evidence of feasibility for those undertaking basic endovascular intervention in the prehospital, emergency department, or basic trauma room setting. For endovascular techniques to be most effective in the setting of injury and shock, providers other than endovascular surgeons and interventionists will need to attain access and catheter-based skills.3,23-25 Patients with acute injury who are bleeding require immediate attention, whether at the point of injury, during the en route care setting, or in the emergency department. Because of the acuity of these patients, resuscitation and stabilization maneuvers must be performed quickly, often before the arrival of an endovascular specialist. Finally, the military’s trauma care and research programs have recently emphasized catheter-based innovation that can be applied to scenarios of acute injury and shock. The pace of innovation for age-related disease over the past decades has been swift and has resulted in development and refinement of approaches for cardiac and peripheral vascular disease (eg, coronary artery disease, cardiac valvular disease, and the spectrum of aortic pathology). This endovascular innovation has reduced morbidity and mortality associated with many different disease states, but it has to a relative degree neglected scenarios of trauma. Examples of catheter-based research and device development for acute injury and shock exist, including the ER-REBOA balloon catheter (Pryor Medical Devices, Inc.), which has useful features for large vessel occlusion in the acute setting. However, the capacity for new life-saving endovascular innovation for conditions of injury and shock appears to be much greater. The military’s trauma research program has attempted to spur such innovation, including new approaches to vascular access, vascular injury repair, hemorrhage control, maintenance of cerebral perfusion, and extracorporeal organ support. Additionally, new technologies developed for managing trauma may lead to adjuncts such as automated variable aortic control, whole body or regional cooling, and catheter-directed delivery of pharmaceuticals or cellular therapies that improve survival and recovery. Prior to and during the wars in Afghanistan and Iraq, lessons in endovascular therapies came largely from the civilian sector. As the first wars to occur during the endovascular era and the first in which endovascular specialists were deployed, the military adopted these lessons and technologies and showed that they can be used to manage certain scenarios of combat injury. In this effort, the military demonstrated efficacy and efficiency of a trauma-specific endovascular inventory. Today, evidence shows that the majority of combat-related mortality occurs from hemorrhage during the acute phases of care. To address this, it is necessary for vascular access and resuscitative endovascular skills to be attained by providers other than today’s endovascular specialists.23-25 Development of devices that are easily used in the acute setting is needed. 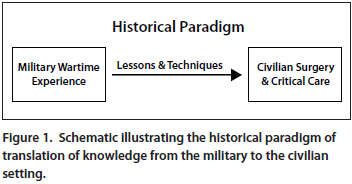 As the military and civilian endovascular communities continue to collaborate, it will be important to continue to recognize shared experiences, priorities, and innovative capabilities (Figure 3). If developed, this partnership has the potential to catalyze innovation and practice that will improve survival and recovery of all severely injured patients. Todd E. Rasmussen, MD, is with the Department of Defense Combat Casualty Care Research Program in Fort Detrick, Maryland; and The Norman M. Rich Department of Surgery, Uniformed Services University of the Health Sciences in Bethesda, Maryland. He has stated that he has no financial interests related to this article. Dr. Rasmussen may be reached at todd.e.rasmussen.mil@mail.mil. James B. Sampson, MD, is with the David Grant United States Air Force Medical Center, Travis Air Force Base in California; and The Norman M. Rich Department of Surgery, Uniformed Services University of the Health Sciences in Bethesda, Maryland. He has stated that he has no financial interests related to this article. Jeremy W. Cannon, MD, is with the Department of Trauma, Critical Care, & Emergency Surgery, University of Pennsylvania in Philadelphia, Pennsylvania; and The Norman M. Rich Department of Surgery, Uniformed Services University of the Health Sciences in Bethesda, Maryland. He has stated that he has no financial interests related to this article. W. Darrin Clouse, MD, is with Harvard Medical School, Division of Vascular and Endovascular Surgery, Massachusetts General Hospital in Boston, Massachusetts; and The Norman M. Rich Department of Surgery, Uniformed Services University of the Health Sciences in Bethesda, Maryland. He has stated that he has no financial interests related to this article. 1. Reuben BC, Whitten MG, Sarfati M, Kraiss LW. Increasing use of endovascular therapy in acute arterial injuries: analysis of the National Trauma Data Bank. J Vasc Surg. 2007;46:1222-1226. 2. Avery LE, Stahfield KR, Corcos AC, et al. Evolving role of endovascular techniques for traumatic vascular injury: a changing landscape? J Trauma Acute Care Surg. 2012;72:41-46. 3. Rasmussen TE, Woodson J, Rich NM, Mattox KL. Current opinion: vascular injury at a crossroads. J Trauma. 2011;70:1291-1293. 4. DuBose JJ, Rajani R, Gilani R, et al. Endovascular management of axillo-subclavian arterial injury: a review of published experience. Injury. 2012;43:1785-1792. 5. Azizzadeh A, Ray HM, Dubose JJ, et al. Outcomes of endovascular repair for patients with blunt traumatic aortic injury. J Trauma Acute Care Surg. 2014;76:510-516. 6. Burlew CC, Moore EE, Smith WR, et al. Preperitoneal pelvic packing/external fixation with secondary angioembolization: optimal care for life-threatening hemorrhage from unstable pelvic fractures. J Am Coll Surg. 2011;212:628-635. 7. Zarzaur BL, Kozar R, Myers JG, et al. The splenic injury outcomes trial: an American Association for the Surgery of Trauma multi-institutional study. J Trauma Acute Care Surg. 2015;79:335-342. 8. Brillantino A, Iacobellis F, Robustelli U, et al. Non operative management of blunt splenic trauma: a prospective evaluation of a standardized treatment protocol [published online ahead of print September 28, 2015]. Eur J Trauma Emerg Surg. 9. Stannard A, Eliason JE, Rasmussen TE. Resuscitative endovascular balloon occlusionof the aorta (REBOA) as an adjunct for hemorrhagic shock. J Trauma. 2011;71:1869-1872. 10. Moore LJ, Brenner M, Kozar RA, et al. Implementation of resuscitative endovascular balloon occlusion of the aorta as an alternative to resuscitative thoracotomy for noncompressible truncal hemorrhage. J Trauma Acute Care Surg. 2015;79:523-532. 11. Holcomb JB, Fox EE, Scalea TM, et al. Current opinion on catheter-based hemorrhage control in trauma patients. J Trauma Acute Care Surg. 2014;76:888-893. 12. Pruitt BA Jr. Combat casualty care and surgical progress. Ann Surg. 2006;243:715-729. 13. Tuffier T. French surgery in 1915. Br J Surg. 1917;4:420-432. 14. Makins GH. Gunshot injuries to the blood vessels. Bristol, UK: John Wright and Sons, Ltd; 1919. 15. Blakemore AH, Lord JW. A nonsuture method of blood vessel anastomosis: review of experimental study report of clinical cases. Ann Surg. 1945;121:435-452. 16. Hughes CW. Use of an intra-aortic balloon catheter tamponade for controlling intraabdominal hemorrhage in man. Surgery. 1954;36:65-68. 17. Rasmussen TE, Clouse WD, Peck MA, et al. The development and implementation of endovascular capabilities in wartime. J Trauma. 2008;64:1169-1176. 18. Eastridge BJ, Mabry RL, Seguin P, et al. Death on the battlefield (2001–2011): implications for the future of combat casualty care. J Trauma Acute Care Surg. 2012;73:S431-S437. 19. Kotwal RS, Howard JT, Orman JA, et al. The effect of a golden hour policy on the morbidity and mortality of combat casualties [published online ahead of print September 30, 2015]. JAMA Surg. 20. Gawande A. Casualties of war—military care for the wounded from Iraq and Afghanistan. N Engl J Med. 2004;351:2471-2475. 21. Rich NM, Hughes CW, Debakey ME. Recognition of Air Force surgeons at Wilford Hall Medical Center-supported 332nd EMDG/Air Force Theater Hospital, Balad Air Base, Iraq. J Vasc Surg. 2007;46:1312-1313. 22. Propper BW, Alley JB, Gifford SM, et al. Endovascular treatment of blunt aortic injury in Iraq: extension of innovative endovascular capabilities to the modern battlefield. Ann Vasc Surg. 2009;23:687. 23. Villamaria CY, Eliason JL, Napolitano LM, et al. Endovascular Skills for Trauma and Resuscitative Surgery (ESTARS) course: curriculum development, content validation, and program assessment. J Trauma Acute Care Surg. 2014;76:929-936. 24. True N, Siler S, Manning JE. Endovascular resuscitation techniques for severe hemorrhagic shock and traumatic arrest in the pre-surgical setting. J Spec Oper Med. 2013;13:33-37. 25. Chaudry M, Clark J, Wilson MH, et al. 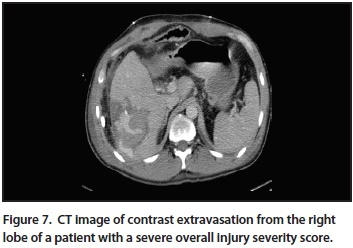 Traumatic intra-abdominal hemorrhage control: has current technology tipped the balance toward a role for prehospital intervention. J Trauma Acute Care Surg. 2015;78:153-163. A single-center experience and first reported evaluation of filter placement outcomes. Devices and techniques for treating this condition. A look at improving the care of traumatic vascular injuries in a new era of vascular surgery. Key devices that every interventionist should have on hand. Determining appropriate intervention based on lesion severity and patient characteristics.